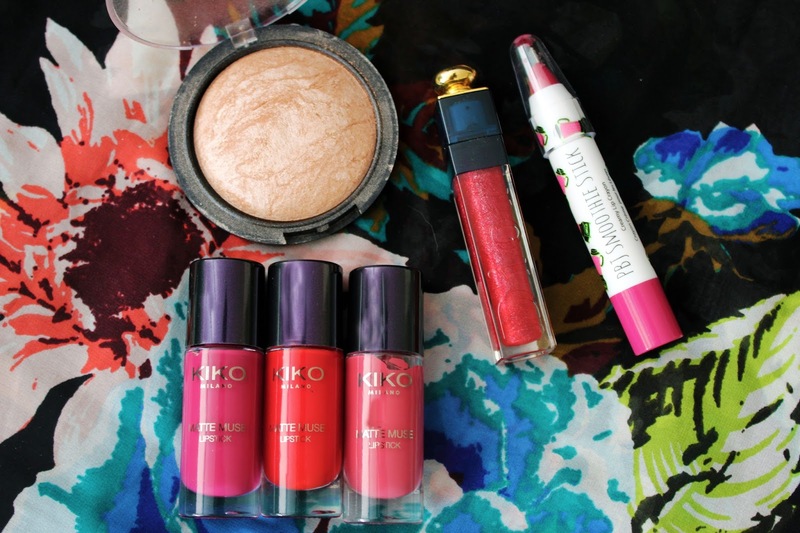 Miss Singh: SPRING BEAUTY PICKS! Spring is almost here and I have been loving these products and had to share them with all of you. My skin changes during this time of the year which is why I like to switch up my skincare and makeup. Enjoy! 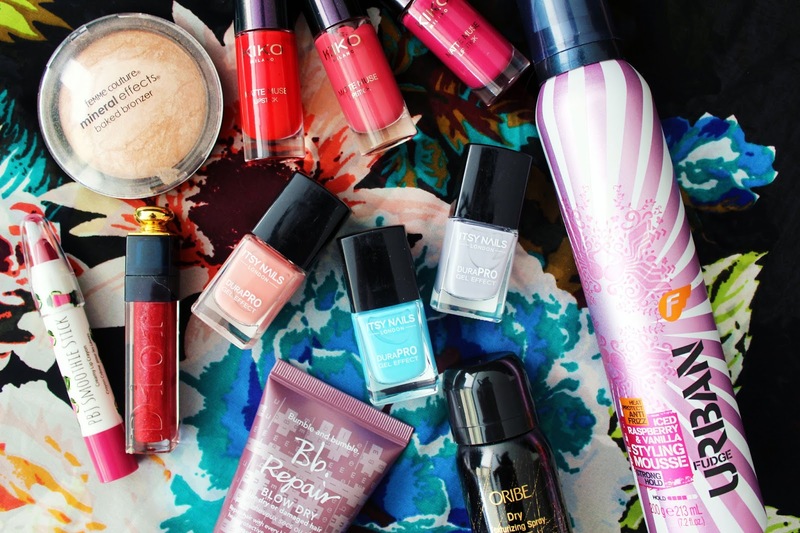 I have divided these beauty picks in four categories: Skincare, Makeup, Haircare and Nails! Skincare: If you know me, you know I am always trying new skincare products. Recently, I have been loving my Birchbox samples that have really helped mix up my skincare routine. I have a larger skincare routine, but these are just some new picks that work for me with this weather. Mitchell and Peach Flora No.1 Fine Radiance Face Oil: Usually when the weather is changing from the cold months to spring, my skin gets super dry and dehydrated, which is why I have been obsessed with face oils. I have been using oils for a long time, but just started using them again. I have a whole post on my favorite oils here. The Mitchell and Peach oil is divine. It smells amazing and just helps with my skin being radiant, plumper and over all happy. It smells so good and doesn't leave any oily residue, which is so essential when you use oils. I mix in with my moisturizer and it soaks it all in. Supergoop Advanced Anti-aging Eye Cream SPF 37: I always use eye cream, but I have never tried one with sunscreen. This eye cream is super hydrating and has SPF which is amazing for this time of year. The sun is out more and SPF is very much needed, which is why I have been loving this product. I am glad that I have protection from sun damage even under my eyes as that is the fastest area to age. Manefit Beauty Planner Cucumber Sheet Mask: The whole sheet mask trend is super big at the moment and after trying a few I know they work! I love hydrating masks that are refreshing and cooling when it's warm outside. It's soothing because of the cucumber and is made of microfiber material which is comfortable and doesn't slip of your face. I love sheet masks for travel as well, as they are not messy at all. I never rinse my face after, just massage in the left over product on my skin. Garnier SkinActive Micellar Cleansing Water: My new favorite makeup remover and micellar water is here and its super affordable! I have been using micellar water for a few years now and I truly love them. This one is super easy to use and never breaks me out. It takes all my makeup off(even waterproof) without leaving my skin stripped. It is seriously a must have for me and you can buy it at the drugstore. Makeup: Let's talk about the fun stuff now! I love makeup and I love to experiment with it during the seasonal change. Kiko Matte Lipsticks: I love matte lipsticks because they last all day and overall the whole matte look on the lips is my all time favorite. 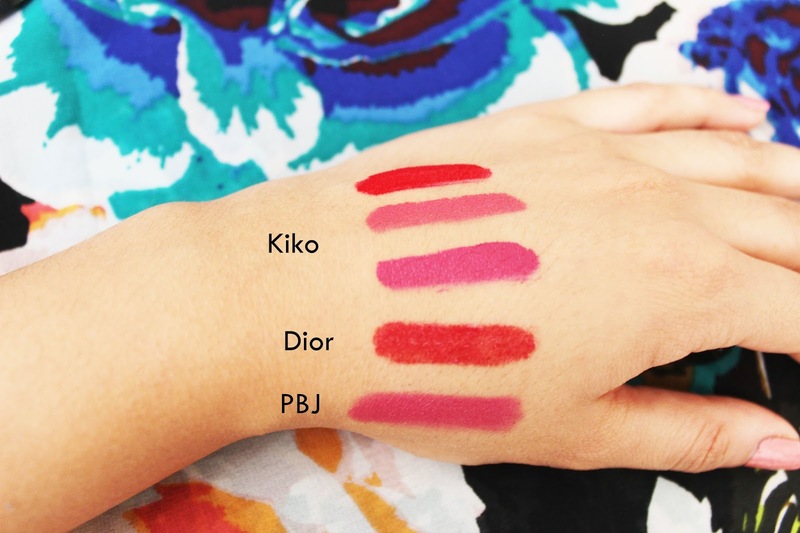 I think these are limited edition and can be found on Kiko's website, but all their liquid lipsticks are amazing as well as affordable. I have three shades in these. 2, 4 and 5. They are pigmented and really make a statement. Dior Ultragloss Lip Glosses: They have actually changed the packaging of these lip glosses now, but I totally love mine. I bought at duty free when I was traveling. I am not a big fan of lip glosses, but these are creamy and have amazing pigmentation. They are not sticky, but still last long and when applied with a matte lipstick, add an extra plump to the lips. PBJ Smoothie Stick Lip Crayon: I didn't love this lip crayon at first, but after using it a couple times now, I love it so much. It's creamy, smooth and smells like berries. I like to carry a lip balm with me in the spring time, but this is such a big step up. It is hydrating like a lip balm and easy to just carry around with you. The color is this pretty berry pink that is a perfect every day color. Femme Couture Mineral Effects Baked Bronzer Summer Kiss: This highlighter has changed my life people! So dramatic, but its true! I love highlighters, especially when it's spring and the sun is shining on my cheekbones. This stuff is around $10 at Sally's Beauty and is gorgeous. It is pigmented and comparable to high end highlighters, like Becca's Champagne Pop and Mineralize skin-finishes from Mac, which are way more expensive. It highlights and creates such a gorgeous glow. If you want to look lit from within, go and get this stuff. It delivers the best glow you can ask for! Haircare: I have collected some great hair products these fast few months and some of them include these three. Bumble and Bumble Repair Blow Dry Cream: This stuff is perfect to use after you wash hair. It helps the frizzy, damaged hair and provides shine. It smells good and isn't sticky at all. Usually these hair creams can be extremely oily and sticky, but this one is really good. I love Bumble and Bumble and will be trying out more products. Oribe Dry Texturing Spray: This is such a hyped up product and it is truly worth it. I have a travel size one but I did have a full size a couple months ago. It works! If you want texture, you want that oomph after styling your hair, get this product. It is a little pricey, but worth every penny. It smells amazing too and works with every type of hair. This is incredible. If you have thin fine hair or thick hair, it will work for you and create that extra volume! Fudge Urban Iced Raspberry and Vanilla Mousse: I love messy waves and volume for the spring time look for my hair and this mousse will help you achieve that. Gives a ton of volume and a great amount of hold. I use some of this on wet hair to scrunch my hair or to just use it on my scalp for some volume. It smells like raspberries. Nails: Usually I get my nails done, but this month I have some nail polish favorites that I haven't been able to put down. I love these three colors so much! Itsy Nails London: Usually my nail polish chips easily, but not with these nail polishes. They are super non-chip and easy to apply. I love the brush and the quality of the product because it lasts long and is super pigmented. The nail polish lasted without chipping for about a week which is unlike any other nail polishes I apply unless its gel polish from the salon. You need one to two coats for it to look perfect and have that shiny gel effect. These are created with a gel effect technology which is why they last long and stay put. Itsy Nails were kind enough to send me these samples! I have the colors Deep Blue, Bohemian Gypsy and City Girl. I highly recommend these if you are looking for new spring nail colors. You can use my code "misssingh" which will get you 10% Discount on first orders, along with Free UK standard Delivery over £10 and Free worldwide shipping on orders over £20. What are your spring beauty picks? Disclaimer: All these products were purchased by me except for the Itsy nail polishes that were kindly sent to me by Itsy Nails London. All my opinions are my own and 100% true.